Upon first glance, our (human) relationship with water is simple: we need water to live. What is less simple is exactly how we satisfy this fundamental need. How many of us that are fortunate enough to access drinking water straight from our tap ever really stop to consider where our water comes from? The city of Santa Monica relies on underground aquifers (groundwater) for much of its water supply. Sourced high in the Santa Monica Mountains, water that falls as rain percolates into underground reservoirs filling an area known as the Santa Monica basin. Unfortunately, this precious resource was contaminated with the gasoline additive Methyl tert-Butyl Ether (MTBE) more than 20 years ago. The Santa Monica Water Treatment Plant and Laboratory was established as a part of an aquifer remediation program that works to remove this contaminate while pursing advanced treatment processes to further protect public health. 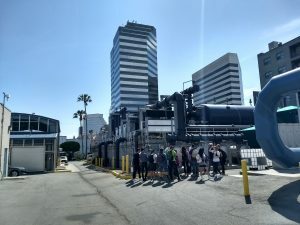 The plant can supply as much as 75% of Santa Monica’s water and is a key player in the move toward the city’s goal of water self-sufficiency by 2022. 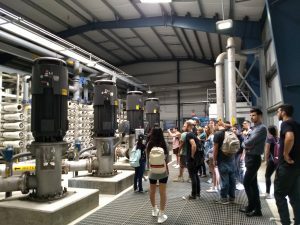 During a tour of the Santa Monica Water Treatment Plant and Laboratory, Professor Melendez’s Physical Geology students discovered that the water that flows from the tap at Santa Monica College is the product of an orchestrated symphony of systems and infrastructure. From source to tap, the water flows through a series of moving parts and people all working together to ensure that when you turn on your tap your water flows and it is safe to drink. 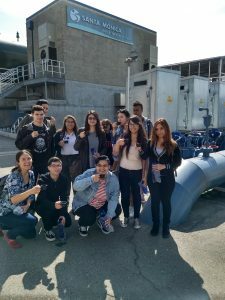 At the end of the tour, the professor and students alike toasted to some freshly treated Santa Monica city water! 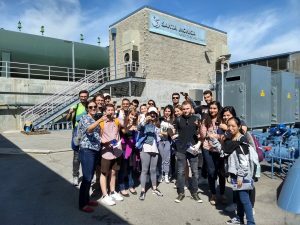 Special thanks to Jason, Abel, and Jack at the Santa Monica Water Treatment Plant and Laboratory for the very detailed and informative tour!